Anatomy, the cornerstone of medicine, assumed central importance in medical education with the institution of human dissection in fourteenth century Italy. Printed and illustrated anatomy texts soon supplemented university instruction. A notable early example of this literature is found in Johannes de Ketham’s Fasciculus Medicinae (1491), a collection including Mondino dei Liuzzi’s Anatomia (1316) and featuring one of the earliest images of an anatomy lesson. 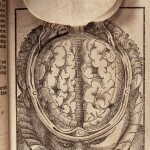 This was followed by a succession of remarkable and beautiful anatomical atlases over the next four centuries, many of which are found in the Dittrick rare book collection. These books are cataloged into the university library catalog see; http://catalog.case.edu/. Researchers who want to use our collections should consult our Research pages for policies and procedures. Below you will find a small sampling of our extensive collection dating from the late fifteenth century. Charles ETIENNE [Carolus Stephanus] (CA. 1505-1564) De Dissectione Partium Corporis Humani Libri Tres. Paris, Simon de Collines, 1545. 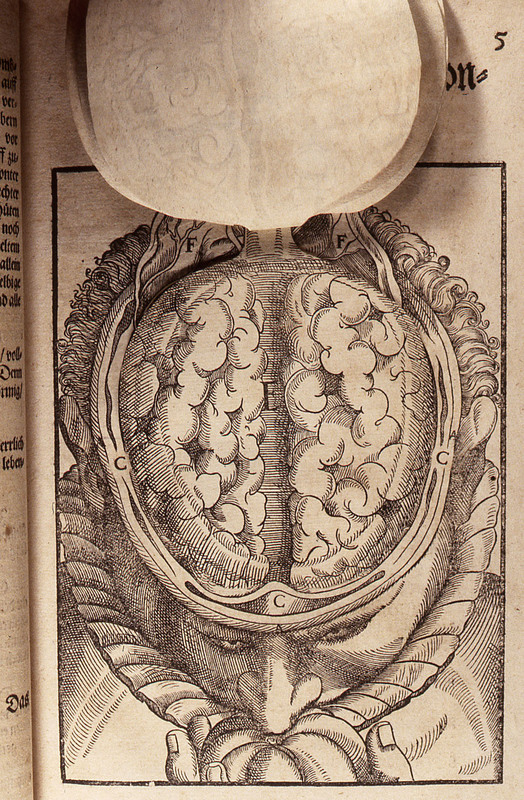 This anatomical atlas, although drawn from dissection, did not reject Galenism as did the Fabrica of Vesalius. Published in both Latin and French editions its anatomical figures are set inside existing Renaissance woodcuts sometimes to startling effect. It is considered an example of pre-Vesalian anatomy even though it was printed two years after the Humani Corporis Fabrica. Our library has two copies of the Latin edition of 1545. One is a tall copy bound in contemporary vellum; the other is in modern vellum, decorated with musical notation and bearing the bookplate of the Cushing family. Andreas VESALIUS (1514-1564) . . . de Humani Corporis Fabrica Libri Septem. Basel. Joannis Oporinus, 1555. The second edition of the Fabrica is considered the most elegant printing of this work. The first appearance of this atlas (1543) revolutionized our understanding of the human body by presenting human anatomy as observed through dissection and not as it was viewed through Galenistic doctrine. For the first time the body was presented in systems – skeletal, muscular, nervous system and the like and made visible by the brilliant woodcuts of the school of Titian and Jean of Calcar. Our copy is bound in a 16th century style sheepskin binding designed by Jan Sobota. It was given to the Cleveland Medical Library Association by Howard Kelly of Baltimore to be the first book in our library’s collection. 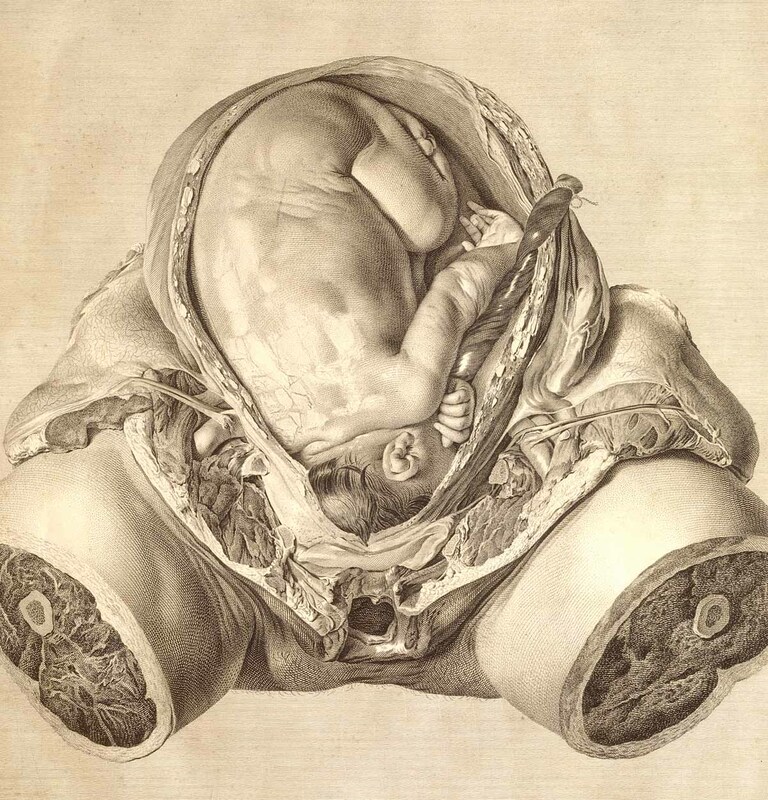 There are many other editions of the Fabrica in our anatomical collections. Rarest and most interesting perhaps is the pirated edition printed in London in 1545 by Thomas Geminus. Geminus copied the woodcuts onto copper engravings for the English market thus bringing the “new anatomy” and its revolutionary ideas to England within two years after its original publication. Gautier D’Agoty boasts in his preface that in making this anatomy he was “demonstrator, artist and engraver all in one.” His work includes life-sized plates done in a four- color plate process. The Library’s copies of Gautier D’Agoty’s various works include plates both untouched and shellacked. 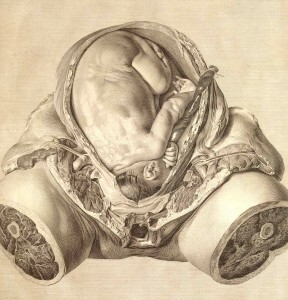 William HUNTER (1718-1783) Anatomia Uteri Humani Gravidi Tabulis Illustrata . . . The Anatomy of the Human Gravid Uterus Exhibited in Figures. Birmingham, J. Baskerville, 1774. One of the most beautiful obstetrical atlases ever published and one of two medical books printed by the famous Baskerville press. It took Hunter well over twenty-five years to complete this immense work. Thirty-four life-size copperplate engravings were executed by the best artists of the day depicting both normal and pathologic conditions. The text is in both Latin and English. The Library owns two copies, each with different plates. Jean Baptiste Marc BOURGERY (1797-1849) Traité Complet de l’Anatomie de l’Homme Comprenant la Médecine Opératoire. Paris, C.A. Delaunay, editeur, 1831-1854. This magnificent atlas of the 19th century utilizes color lithography to its fullest advantage. Bourgery’s collaboration with Nicolas Henri Jacob (1782-1871), a student of the French painter, Jacques Louis David, produced 750 anatomical and surgical drawings. The text is by Bourgery who was a physician. Our atlas is in twelve volumes and was presented to the library by a former Bishop of Cleveland, Ignatius Horstman. Researchers interested in our collections should consult the Research page in this website. Georg, BARTISCH (1535-1606) Opthalmodouleia Das ist Augendienst. [Dresden] 1583. This historic work, published in German, raised ophthalmology beyond the primitive practices of the time. Called the “father of modern ophthalmology”, Bartisch discusses cataract surgery, eye excision and the use of spectacles. This work is particularly noted for its woodcut illustrations showing techniques of Renaissance eye surgery. Our copy is bound in stamped pigskin. The several flap illustrations are intact. Leopold AUENBRUGGER (1722-1809) Inventum Novum ex Percussione Thoracis Humani ut Signo Abstrusos Interni Pectoris Morbos Detegendi. Vindobonae [Vienna] J.T. Trattner, 1761. This seminal work on immediate percussion as a diagnostic tool remained little known until J.N.Corvisart, physician to Napoleon, published a French translation in 1808. Our library owns two copies of the first edition, first issue, one, a tall copy once owned by the H. K. Cushing family and the other from the library of the medical historian, Henry Handerson. In addition to the original work and Corvisart’s translation, our collections hold the first (largely ignored) French translation of Rosiere de la Chassagne (1770) and the publication of Maximilian Stoll (1786) of Vienna whose favorable comments on Auenbrugger’s research caught the attention of Corvisart.